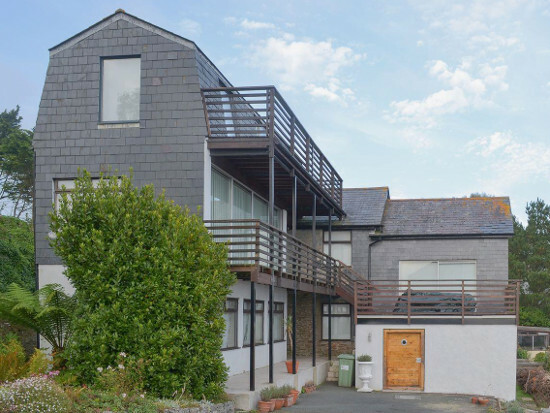 "Seacliff Cottage" in Strete, just down the road from Dartmouth, in south Devon, sleeps 8 people. Seacliff Cottage offers some terrific views from most of the rooms - with the living room being on the top floor to give you those views. Seacliff Cottage sleeps 8 people in 5 bedrooms. The bedrooms are made up of 3 double bedrooms, and 2 single bedrooms. There are 2 bathrooms at Seacliff Cottage too. The living room, on the top floor, has a TV and patio doors leading to the balcony. There is a kitchen with electric cooker, microwave and fridge/freezer; and a utility room with a washing machine and fridge. Seacliff Cottage has central heating and Wi-Fi, with your towels and bed linen included. There i parking for 6 cars at Seacliff Cottage. Seacliff Cottage has a quiet position looking out over the sea - the photo below gives you an idea of the views you'll get from the balcony on the top floor. There are various towns and villages to visit on your holiday, with Dartmouth, Kingsbridge, Brixham, Salcombe and Totnes all a short drive. The beach at Slapton Sands is just down the road, and has a special historical interest as the practice runs for the D-Day landings were held at Slapton Sands. The nearest shop, pub and restaurant are ¼ mile from Seacliff Cottage; with the beach being ½ mile. Should Seacliff Cottage not be to your liking, but you fancy staying in the area around Dartmouth, you might well be interested in the cottages below. All these cottages are within a few miles of Seacliff Cottage.